MEXICO CITY - Mexico's attorney general said Thursday that he was calling on Interpol to help authorities capture a lawmaker suspected of having ties to a drug cartel. 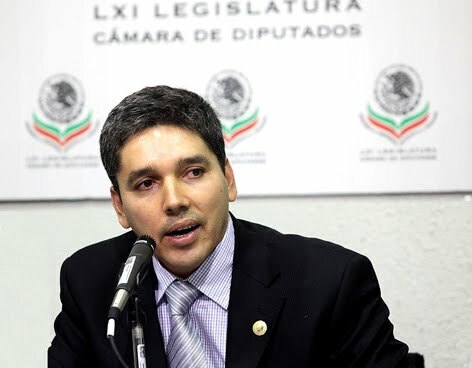 Mexico's top prosecutor, Arturo Chavez Chavez, vowed to arrest Julio Cesar Godoy Toscano, a federal deputy whose immunity from prosecution was stripped by Congress this week. Traditionally, suspect Mexican politicians are pursued after they leave office - if at all. But Godoy became an embarrassment and liability to the political class, especially after investigators released a recorded phone call of him allegedly speaking with a high-ranking member of the drug trafficking cartel known as La Familia. The cartel has emerged as Mexico's top methamphetamine producer from the mango and avocado farm towns of western Michoacan, where Godoy's stepbrother is governor. At a news conference in September, Godoy swore his innocence and denied ties to the drug gang. "Enough is enough. This is political harassment," Godoy said, calling the pending charges ridiculous, stupid, aberrant and dumb. "I am not a criminal." Godoy was sworn into Congress in September in spite of an arrest warrant against him. Before he arrived to take the oath of office - and slipped past security forces - Godoy had been on the lam for more than a year. Earlier this week, the lower house of Congress voted 384 to 2 to deny the politician the gold-plated immunity that serving politicians here enjoy. Investigators say they want to know how Godoy managed to amass more than $2 million in his bank accounts. But federal prosecutors have generally had a hard time making formal charges stick. They rounded up a dozen mayors in Michoacan last year, but after the publicity of the mass arrests died down, they released them all, unable to make a single corruption case. The attorney general said he had no idea where Godoy had run to. But La Familia has been shaken in recent months. In a wild firefight last week, Mexican police and troops laid siege to a cartel safehouse in Michoacan. Authorities said Thursday they believe they killed cartel leader Nazario Moreno Gonzalez but conceded they have not found his body. Five policemen and three civilians were also killed in the attacks. In his meeting with reporters, the attorney general said 30,196 people have been killed in drug-related violence across the country since President Felipe Calderon first sent troops against the cartels in his home state of Michoacan. Earlier this week, the border town od Ciudad Juarez also broke a grim record: More than 3,000 people have been killed there this year. Thanks for posting this Smurf! that immunity crap I never understood, it should be eleminated everywhere...and lets begin here in the US or UN...diplomatic immunity protects 160 nations from any form of procecution or civil law suits.